The Honorable George Knox Cracraft, Jr. 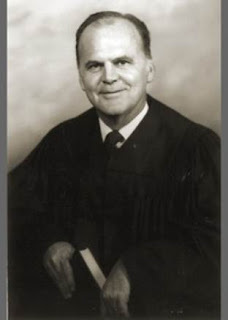 The Honorable Judge George Knox Cracraft, Jr. ,88, of Helena died Sunday morning, August 28, 2011 at Helena Regional Medical Center. He was born September 29, 1922 at Eudora, AR. to George Knox Cracraft, SR. and Jean Scott Cracraft. He graduated from Helena High School in 1940. He received his Bachelor of Arts degree from the University of the South in Sewanee, TN where he was an active member of Phi Delta Theta fraternity and the Honor Council. He also received his Bachelor of Law from Harvard Law School in Cambridge, MA in 1947. Upon returning from the war, Judge Cracraft married the former Kathleen Hagan from Grosse Pointe, MI and began his career in law and started his family. He returned to Helena after law school to begin his practice. He was City Attorney for West Helena from 1949 to 1951 Deputy Prosecuting Attorney of Phillips County and served on the City of Helena Planning Commission. He served as a justice on the Court of Appeals of the State of Arkansas from 1981-1992 and served as the Chief Justice from 1991-1992. He leaves his beloved wife of 67 years Kathleen Hagan Cracraft of Helena, AR; 4 daughters Kathy Hendrickson and her husband Tom of Germantown, MD; Jeannie Turley and her husband Gibson of Helena, AR; Judy Schieffler and her husband the Rev. Danny of Little Rock, AR; Susan Maddox of Helena, AR; 9 Grandchildren: Gibson Turley and his wife Julie of Vancouver, British Columbia; Susan Carmi and her husband Ritch of Potomac, MD; Tracy Hartsel and her husband Justin of Herndon, VA; Kathy Bush and her husband Brian of Wilimington, NC; George David Schieffler of Fayetteville, AR; Becky Beadling and her husband Conrad of Germantown, MD; Sarah Higuchi and her husband Eric of Denver, CO; Laura Schieffler of Little Rock, AR; and Jenny Maddox of Little Rock, AR; 6 Great grandchildren; Samuel Knox Bush, Haily Carmi, Taylor Carmi, Nathan Hartsel, Logan Bush and Andrew Hartsel.